Made up of nine panels, the work references the nine bends of the River Styx. Each panel is layered with twenty-eight small square segments, representing one lunar month. At the beginning, the panels appear heavy, darkened with small lead squares and acrylic stains. 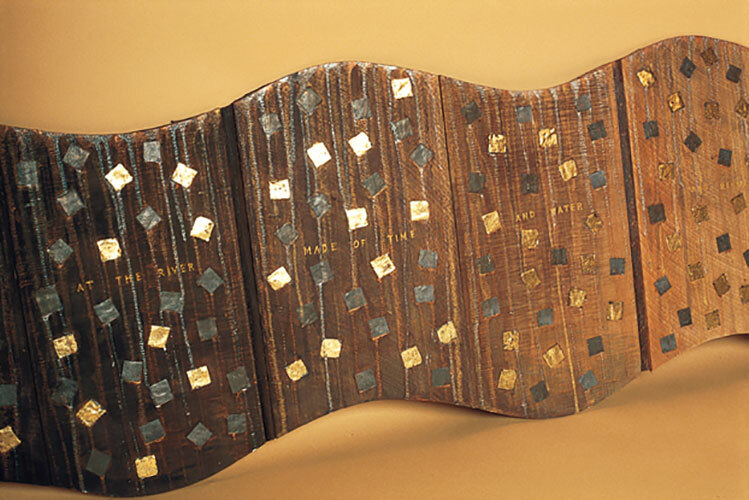 The panels gradually merge until at the opposite end, the pages are flooded with light and small squares of gold leaf. "...to gaze at the river made of time and water and recall that time itself is another river..."
Dimensions: Length 2430mm x Height 500mm x Depth 120mm (when folded). Materials: Salvaged rimu, leather hinges, honey, ash, iridescent acrylic paint, segments of lead, gold leaf and rubber-stamped text.